—A stated “objective.” Especially one that’s obvious (“to become an editorial assistant at the University of Chicago Press”), ridiculous (“to achieve greatness and joy in all my endeavors”), or, incredibly, left over from the job you really wanted (“I have made a career commitment to the financial industry”). To me, an objective suggests you shopped at Résumés ’R’ Us. When you apply for a job, your objective is to get the job, which pretty much goes without saying. —Outlandish displays of creative writing. 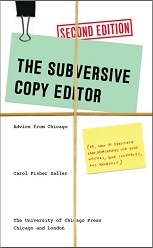 Copyediting is not writing, and the kind of creative thinking that makes a good copyeditor is not the same as the creative thinking that sells hamburgers. A promising copyeditor’s résumé is concise, clear, and honest. It’s intelligently organized, which means the relevant stuff is specified up front. And did I say concise? —Attempts to vaunt “no experience” as “significant experience.” Editors know spin when they see it. If you don’t have much to sell, keep it short and straight. Your biggest asset may simply be your potential. Give the manager reason to trust you. As a mom of twenty-somethings who are on the move, I see the job hunt from both sides of the desk. I know there’s a person attached to every résumé I toss aside, and it doesn’t feel good. I know times are tough. The job in our department was quickly filled—there were actually many fine candidates—but I want you to find a job, too. That’s why I’m telling you what I know. *These opinions are those of a single manager, and they pertain to hiring at an academic press. If you’re applying for a job as a comedy writer, journalist, camp counselor, or Disney character impersonator, your résumé might be fine exactly as it is. to Wednesdays. Thank you for stopping by—I hope you’ll come back on Wednesday to read my advice for résumé writers. p.s. If you’d like something to tide you over, here’s an oldie. Will Dunne is a playwright, scriptwriter, and teacher whose plays have received many international, national, and local honors. I got to know him when I copyedited his book, The Dramatic Writer's Companion: Tools to Develop Characters, Cause Scenes, and Build Stories, for the University of Chicago Press. A couple of times recently I was invited by playwright or director friends to attend staged readings of drafts of new plays. Both times, the audience was made up mainly of actors and writers, and afterward there was a rather intense postmortem, with a moderator guiding the criticism while the author listened and squirmed. I was curious about the process and thought you might be, too, so I asked Will to talk about it. Carol: Have staged readings always been a part of play development? This seems so different from the process of developing a novel or short story. Nature is okay, if you like that sort of thing. But for someone used to the quiet of a city neighborhood, nature can seem pretty noisy. And messy. And annoying—have you ever been to the ocean shore? At first it’s exciting and beautiful, but then the waves keep crashing and crashing and crashing. . . . It can get on your nerves. Incredible! Right away, I wanted to see this for myself. I knew she was kidding about the children, but the rest sounded plausible. Turns out not. Linda confessed: “Actually, bugling is the sound elk make around twilight when they’re calling their sweethearts to come and cavort. At an elk-bugling event, people with special whistles (or, I suppose, just special talents) blow them, and before long, the elk respond with their own moo-ey, creaky, surreal-sounding love songs.” She included a link to a video. A couple of weeks ago, like it or not, I was given a new computer with a new operating system. I hate it. So far I haven’t discovered any new features that will make my work easier among the dozens that hinder it. I am not just being a grumpy old person. This never used to happen. Long ago, when the personal computer was more akin to a hammer and chisel, an upgrade—hardware or software—really meant something. I would rush to acquire it and read the manual straight through, wild to learn all the ways in which my life was about to change. Imagine, children, a time before linked and automatically numbered footnotes. Before color monitors. Before portability. —My first computer, a Mac, had a total memory of 128K. (Not a typo.) Floppy disks held 400K. We couldn’t switch back and forth between the word-processing program and the desktop by clicking with a mouse; we had to push a floppy disk in and out in order to make the switch. Each program (MacWrite, MacPaint, etc.) had its own disk, so of course we could use only one program at a time. —Sound was limited and funky. —Disks commonly got stuck in the machine; the fix was an unbent paperclip poked into the “ejection” hole. —In word processing, Undo was a one-shot deal: that is, it worked only on the last action performed. Undoing something after a save? Forget it. I remember the trepidation involved in considering each save. The later invention of “multiple Undo” was one of the most thrilling technological advances I can recall in my history with word processing. I know that computers and word processing had a history before I came to them in the 1980s; the elders used to speak of things like mainframes and punch cards. Given the pace of research and improvement, I suppose it was inevitable that at some point writers and copy editors would have all the features we need, but software sellers would be compelled to issue upgrades regardless. Feel free to share your own memories and frustrations here. Meanwhile, if I find anything good about my new system, I’ll let you know. From the earliest age, we love and fear being lost. Peek-a-boo, blind man’s bluff, hide and seek—all delicious little moments of panic and relief. The catch is, if you never had it, you ain’t got it. I used to wonder why about the half the time, when I exit the ladies’ room in a strange place, I turn in the wrong direction. Finally it dawned on me that it’s probably because no matter how I got in there, when I leave I turn to the right. And yes, probably about half the time, that’s wrong. If being lost is bad, losing something is worse. Over your lifetime, how many things have you lost, and which do you still lament? If you can remember it, you probably still regret it. I know I do: a baby ring from my grandfather, a quartz rock that looked like a diamond, a baseball glove broken in over twenty years, a before-and-after videotape of a rehabbed apartment, an untyped thesis in a suitcase, stolen. And all of it trivial compared to the loss of people I have loved. But from the trivial to the profound, there’s nothing darker than the grief we feel in loss. If you’re like me, a too common cause of regret and frustration is losing work that’s already done: we leave a briefcase on the train; our laptop crashes; we save an old version in place of the new one. The effects can range from minor inconvenience to costly disaster. We suffer pain from the loss, anger at our own carelessness or bad luck, grief at having to do the work again. So in the interests of productivity and emotional health, let’s remember to practice the easiest kinds of loss prevention: Make a copy. Stay alert. And back up, back up, back up. *Anyone over the age of five gets to call it that. The last time I talked about using color as a word-processing tool, I learned that I’m not the only one who finds it easier than other methods of achieving the same results—not to mention prettier. But I also heard from my colleague and favorite tech guy Russell Harper (as I knew I would), who holds to a somewhat higher standard in these matters. So this time, I’ll show how to use color in searching-and-replacing tasks, with Russell’s added advice for those who want to ramp up their skills to another level. Color comes in handy when you want to replace some but not all instances of something. For instance, it’s common for citations in notes and bibliographies to be inconsistent in spacing after colons. In half the citations you’ll find 4:15, and in the other half, 4: 15. Let’s say you want to delete the spaces globally. First, you have to find them. It’s no good searching for a colon plus a space, because that would include word spaces after colons: like that. You could search for colon + space + number using ^# to find numbers (type : ^#), but then what do you type in the Replace box? Unfortunately, ^# is not an option in MS Word. At this point, rather than look up how to do this with pattern-matching tricks, many editors would resign themselves to fixing the spaces one by one. For those who would find this rewarding, I’ll host a special session sometime with tips on introducing more errors into your manuscripts, just so you can correct them. But you and I can use color. Put number + colon + space + number in the Find box (^#: ^#). Choose a color to put in the Replace box—let’s say orange. ** Replace All. You’ll see that all the numbers + colons + spaces + numbers are now orange. Finally, do a new search for colon + space in orange and replace with just a colon (it doesn’t matter if the Replace box is still tagged with color formatting). All done! Tip: If you leave the color in your document after a replacement, it will catch your eye as you read, prompting you to check each one. When you’re completely done editing, you can Select All and restore the text to black. Instead, find all letter + period + letter combinations (^$.^$), and replace with a color, say purple. Now do a separate pass for three-letter combinations (^$.^$.^$). Finally, search for all purple periods and change to period + space (. ). Simple! Carol: Oops. I actually knew that. One way I deal with it is to start things off by globally changing “e.g.” and “i.e.” (and any other exception I’ve noticed in the document) to another color so as not to catch them in my sweep. Carol: Hold on a second, Russell. What do \1 and \2 stand for? Russell: They stand for whatever is found by the expressions in the first and second set of parentheses, respectively. This gives you the power to find something and replace it with the same thing but modified (in this case, by the addition of a space). Carol: So in your example, there’s a space between \1 and \2 (but no space after \2). You can slow things down by using the Find and Replace boxes the first time around to selectively change each item, ignoring an abbreviation like “U.S.” (or changing it first to “US” if you wish). You can still put a color in the Replace box if you wish to be able to see the results (without tracking changes). Carol: Okay, you’ve convinced me: this is cleaner and safer. It isn’t as easy to remember, but with practice it will be a cinch—and it will be just as pretty if I put my favorite colors in the Replace box. Russell, thank you! Readers, in closing, I’d love to hear whether you love or hate these word-processing tips. Feel free to let me know. I might even be able to talk Russell into stopping by now and then. *Microsoft Word’s wildcards are also called regular expressions, which is what OpenOffice.org Writer calls them. The examples in this post, tailored to Word, can be adapted to work in Writer. **In Word 2007, put your cursor in the Replace box, choose Format, Font, and pick a color. Make sure there is nothing, not even a space, in the Replace box. As long as the Replace box has only the color formatting, the text specified in the Find box will stay put, newly painted with your chosen color. ***Global changes are always dangerous. There are bound to be instances not found in your search, and you’re bound to change things you shouldn’t. As a rule, it’s best to make such corrections only during the initial cleanup of your manuscript, so you’ll notice any glitches as you edit. Russell: I agree. Unless you’re absolutely confident that the pattern is limited to a particular scenario, you should do the replacement case by case. I had a bad week recently and found myself getting behind on my main editing project (“Trade book: Must Not Slide!”). Unscheduled chores kept landing in my in box. As the week progressed and I became more and more grumpy and panicky, I started making mistakes, which only added more work and stress. In The Subversive Copy Editor I make a big deal out of to-do lists and schedules and logs, as if I’m always pulled-together and on top of things. But with so many items to shuffle and monitor, a list seemed like just one more thing demanding attention. Nothing helped. I wanted . . . what? A drink. A good cry. My mom. What’s the answer, when it comes to dealing with work stress? Once I was back on track, I thought of several things I could have done differently during that week. I should have smacked myself and insisted that I make and follow a list. I’m convinced there’s no better therapy for confusion and panic. * When you have a list to direct the order of priority, a hefty chunk of brain is freed from worrying about what’s not getting done at the moment. I should have tidied my desk. At least one of the mistakes I made that week happened because a piece of paper with a Rush tag on it wiggled its way under the mess. Making a separate stack for each project and keeping the tray clear would have been calming. I shouldn’t have freaked out and kvetched to everyone who passed my door. True, it stopped folks from dropping by to chat. But it wasn’t very professional, and it only wasted time. I could have delegated more. I could have thought more clearly about what would happen if the work didn’t get done. My boss has pushed me to do this more than once. (She’s the mother of triplets; I suspect this is a maternal ploy.) When I go crying to her, she says, “What’s the worst that will happen from being late?” And when you think about it, the worst usually boils down to the annoyance of an author or acquiring editor that will last no more than a year or two, depending on the length of the delay. So I take comfort in that. In the case of my bad week, I ended up coming in on the weekend and clearing my desk of peripheral tasks so I could get back to my reading on Monday. It felt good to be unburdened—but at the same time, I was kicking myself for buckling under the strain. Maybe next time I’ll do better. Manual of Style: Being a Compilation of Rules . . .
in Force at the University of Chicago Press, To Which Are Appended Specimens of Types in Use. Having its genesis, more than a decade ago, in a single sheet of fundamentals, jotted down at odd moments for the individual guidance of the first proofreader; added to from year to year, as opportunity would offer or new necessities arise; revised and re-revised as the scope of the work, and, it is hoped, the wisdom of the workers, increased, it emerges in its present form as the embodiment of traditions, the crystallization of usages, the blended product of the reflections of many minds. Do not follow copy blindly, unreasoningly. Proofreading machines are yet to be invented. And as for authors, typographically they very often do not know what they want until they see it in type—and not always then. Do not permit yourself to be stampeded. In the Manual’s first edition, about a third of the text (some seventy-five pages) is given over to type specimens, and a third to “Rules for Composition,” of which punctuation takes fully half the acreage. (Back then, instead of question marks, writers wielded “interrogation points.”) Rules for styling footnotes are herded into a brisk three pages. About many matters in this world, grammar and logic included, there is abundant room for differences of opinion. Grant writers the privilege of preferring theirs to yours. [This manual] does not presume to be inflexibly consistent; applicability, in the printing-office, is a better test than iron-clad consistency, and common-sense a safer guide than abstract logic. . . . If, in addition to this its main object, this Manual of Style may incidentally prove helpful to other gropers in the labyrinths of typographical style, its purpose will have been abundantly realized. Quotations from pp. v, 100, 100, 101, 99, and vi–vii.